California is ahead of the ball when it comes to electric vehicles, with the state having directives to lower greenhouse gas emissions. These directives place special emphasis on the use of low-emission vehicles, and the state has particularly championed EVs by setting a goal to have 1.5 million electric vehicles on the road by 2025. Long before that goal was set, Oakland, Calif., had been pressing electric vehicles into service as far back as the ’90s. In fact, it is just one prong of the city’s four-prong approach to greening its fleet, with the others being the use of renewable diesel, compressed natural gas and its newest, hydrogen. After a 12-year pause in equipment replacement, Oakland has resumed equipment purchasing, utilizing the aforementioned plans to welcome greener vehicles into its fleet. 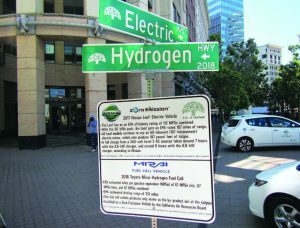 Of its non-law enforcement sedan fleet, 10 percent are battery electric; 25 percent are CNG; 25 percent are hybrids; 5 percent are renewable diesel; and 1 percent are hydrogen — for a total of the sedan fleet being 66 percent alternative fuel or hybrid. Its electric fleet vehicles include 26 battery electric sedans, which are Nissan Leafs, and 63 hybrid-electric Toyota Prius Cs. For those who might have tried early battery electric vehicles in the ’90s and discontinued use, Battersby shared there have been many improvements since those early days. Oakland’s 2017 Nissan Leafs have a 30 kWh pack, which gets an EPA-rated 107 miles of range. A full charge from a 240-volt Level 2 AC source takes around seven hours with the 3.6-kW charger and around six hours with the 6.6-kW charger. Getting that infrastructure in place can be challenging, and Battersby noted it is important to know where the vehicle will be parked. Additionally, he said, “In some jurisdictions, they might have permitting challenges. Some locations might require extensive trenching, which increases the cost. Another consideration is whether or not a station will be accessible to the public, which would open the possibility of collecting fees. Battersby said smart stations are able to take credit cards or other forms of user ID information. “This makes the program self-funding,” he added. Fleet managers will also want to make sure their stations are Americans with Disabilities Act compliant, Battersby said, adding with all the planning such considerations can fall on the wayside until a letter is received. Funding is extremely important. 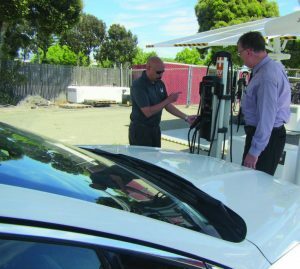 Looking to take advantage of incentives and grants can help ease some of the costs of building infrastructure or even purchasing the EVs. 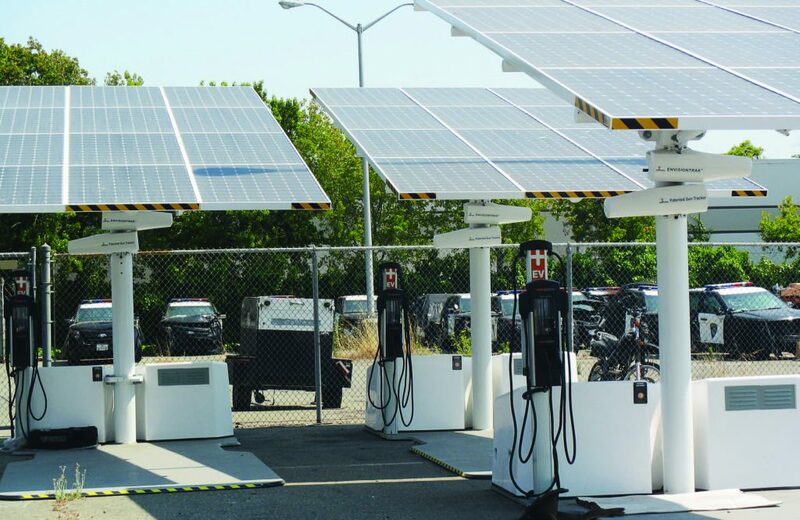 Oakland secured a $500,000 grant to install 48 Level 2 charging ports and four DC Fast Chargers, and it has also installed four EV workplace charging stations. 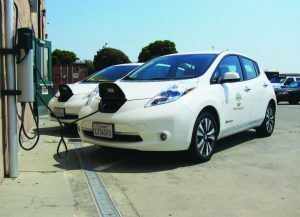 By partnering with Workforce Development on a $133,000 grant application, Oakland’s fleet has been able to install nine Level 2 chargers in city-owned parking facilities and garages; it plans to install an additional 10 yet in 2018. 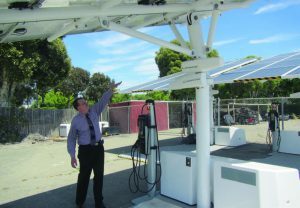 The use of solar charging stations is something Battersby is excited about, noting that while the units are expensive, they also now guarantee that the vehicle being charged at the station is using 100 percent renewable fuel. He encourages other fleets to do research and uncover what grants, incentives and rebates might be available.